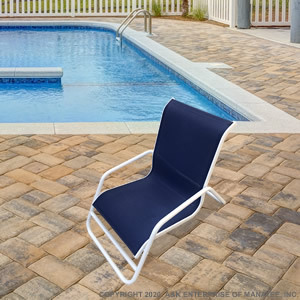 The SC40 Sling Sand Chair is low to the ground with a reclined seating position. Made from 1-inch round extruded aluminum tubing, the SC40 Sling Sand Chair is sandblasted and powder-coated for a premium finish. Customize the SC40 Sling Sand Chair with a large selection of frame and fabric options. The SC40 Sling Sand Chair stacks and cleans easily!